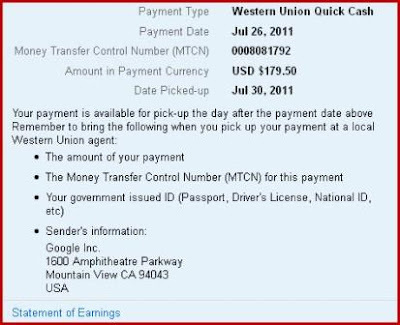 Home Adsense Blog Earnings blog earnings update blog payments dollar Google Adsense income generating blogs Money Transfer Online earning Payments STatement of Earnings Western Union My Third Adsense Payment! Here we go again! Thanks God, I once more received another Adsense Payment! This time it's my third! 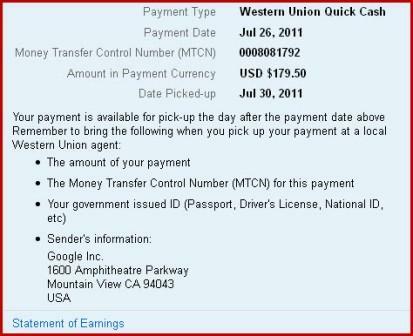 Yeah, this is my third received payments from my Google ads! And this third payment is the highest! 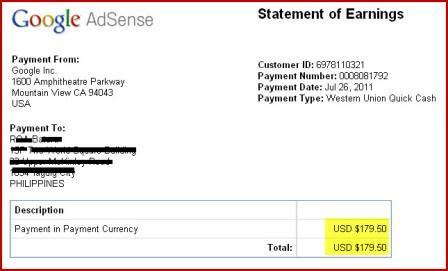 Yup, this is the highest Adsense payment I received so far! The payment is amounting to $179.50. Or in Philippine peso, I received a total of Php8,420. Great! 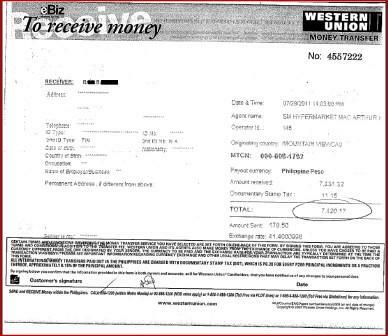 As a standard process, I redeemed my payment in our nearest Western Union outlet! I got it on the last day of July! Just like I always do, I save my money in my bank! But of course I share some to my mother and brother! I gave Php500 to my brother while Php1,000 to my mom! I even gave another Php2,000 to my mother to buy our new gas stove! 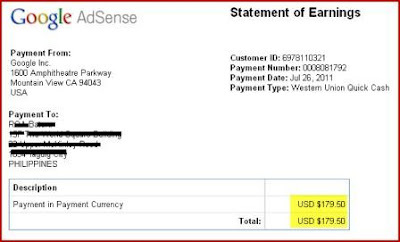 At the end of July, my Adsense earnings closed at $99.14! And for sure by the end of September, I will get another payment when the amount reach a minimum of $100! Yippee!!! Of course, I will share it with you to give you inspiration!